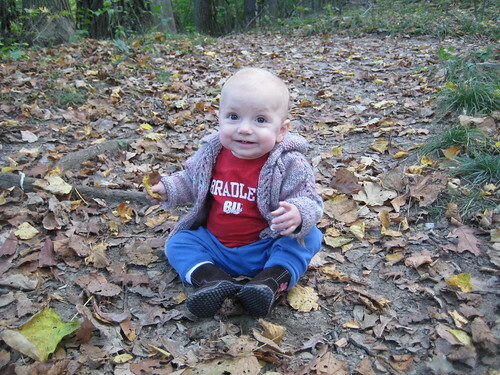 Boo always loved being outdoors. She loved picking up sticks, looking at bugs, running, as soon as she was capable. I wasn’t worried about creating a love of the outdoors, I just needed to permit it to grow. Stewardship was another matter. Why do we stay on the trail? Why do we carry our trash to garbage cans? Why don’t we pick interesting plants? Why can’t we keep collected rocks, sticks, fallen leaves? “If everyone did it, there would be no park” is a really really vague concept for adults, much less a little kid. I already carried a couple small garbage bags for diapers. When she was toddling along, she was very good at spying the bright colors of non-natural things, and she loved to pick them up and give them to me. So we collected trash. And she kept collecting even after being completely potty trained, and now she reminds me to bring a small garbage bag when we hike. Or is it just an excuse to go off-trail? 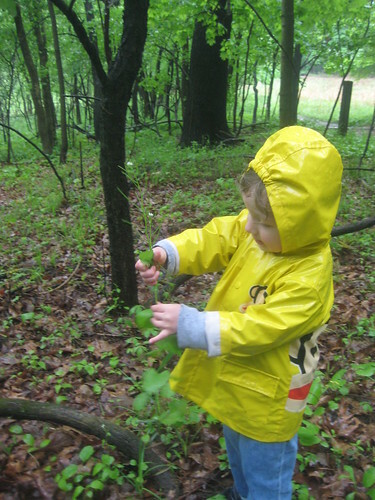 When Boo was 2-years-old, I took her to her first garlic mustard work day. She pulled about three plants then took Grandma Mary and Grandma And hiking and got them lost. Last year I took her out and we pulled most of a garbage bag full. In the rain. She could recognize the garlic mustard that was still in flower, and worked steadily. She was so proud of herself when we deposited our bag in the dumpster. She was helping her park. This year we missed the official work day by getting Lee ready for 2 weeks in Japan. But Boo and I went to the park later and the docent desk had garlic mustard. Boo of course knew what it was, and asked for a leaf to eat. We discussed that it was an invasive, and what that meant. She wheedled a smaller garbage bag out of the park staff, I took a couple super garbage bags, and we hit the trails. Boo felt strongly that she wanted to pull heading uphill. 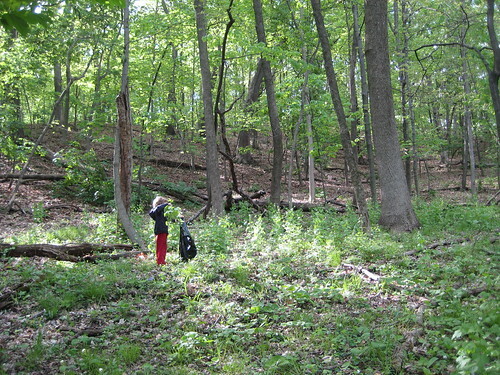 To the point where I told her we were pulling weeds, not climbing the hills off-trail. But we pulled 2 big bags full, and she did a good portion of it. It was really funny listening to her talk. In discussing invasive weeds, she decided that the best way to describe them was “Bad Guys of the Forest”. 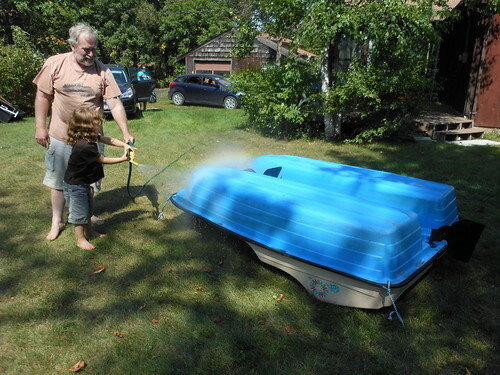 When we visited Grandma Sharon and Grandpa Brad’s cabin in northern MN this summer, they borrowed a paddle boat from a different lake. She asked why we had to wash it so thoroughly. We explained it was like garlic mustard. She grabbed the hose and was awesome quality control. 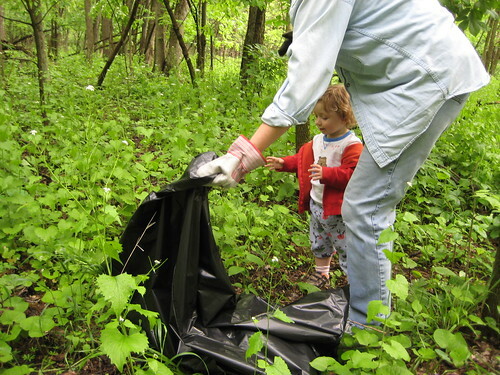 How do you teach your kids to take care of the natural world?